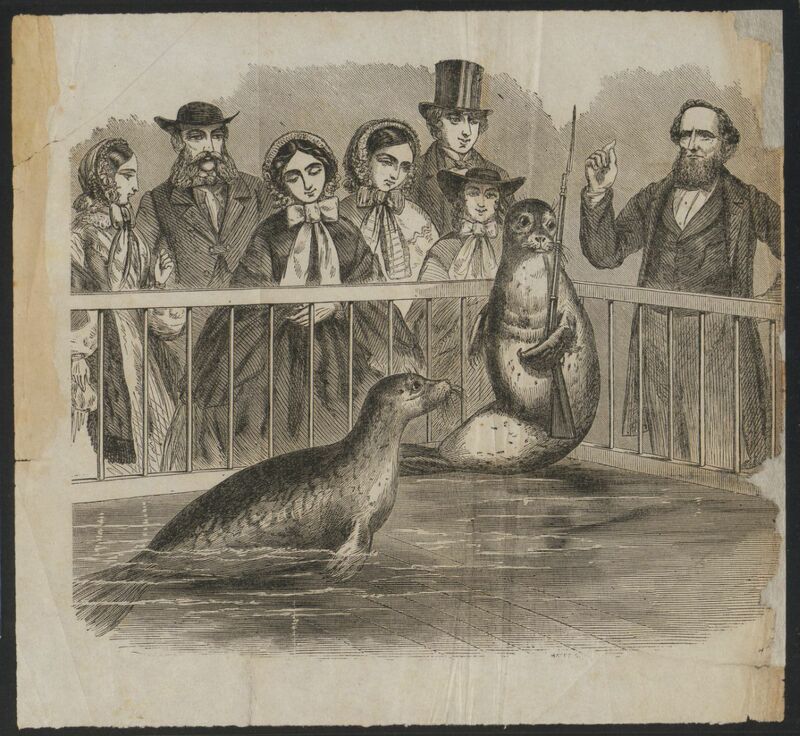 With this blog we hope to draw attention to the intriguing and remarkably rare items discovered by Harvard Library users during the course of their research. 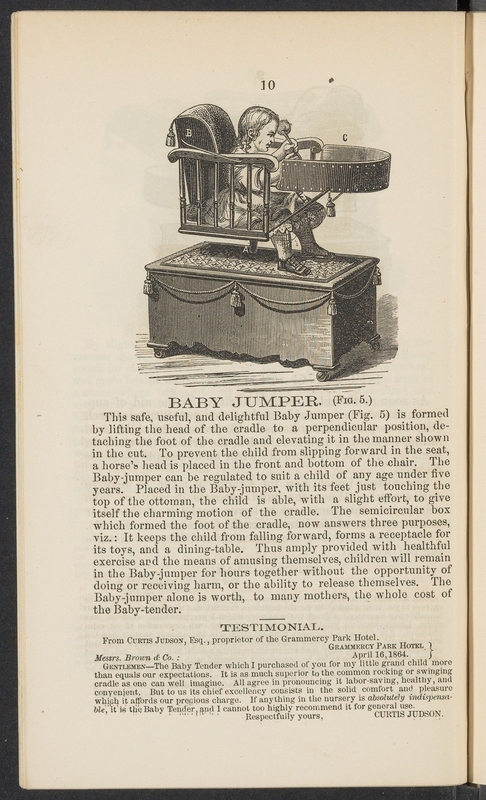 Harvard Library Preservation routinely reviews books returned through circulation, knowing that these returns include a surprising numbers of works that are too deteriorated to survive continued use, and are that too rare and interesting not to share online with the Harvard community, and beyond. Titles are selected for digitization through various criteria such as rarity, condition, use, research relevance, and/or visual content. 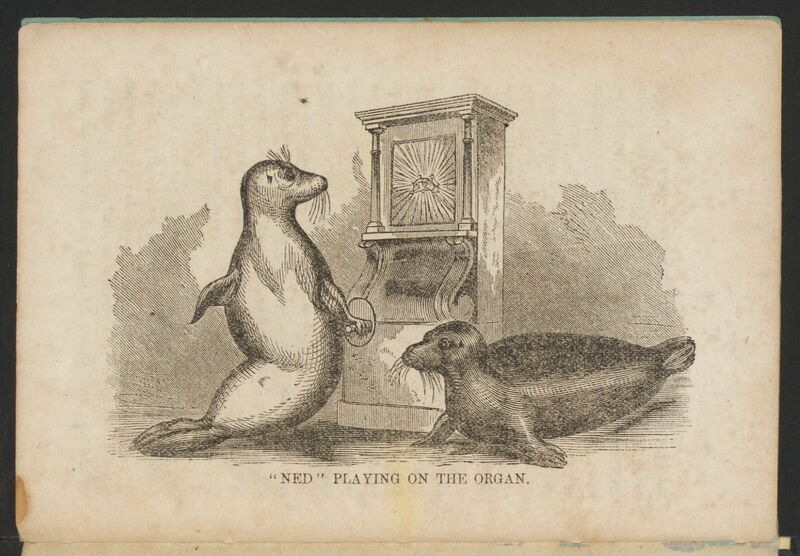 We invite you to peruse the titles posted here as well as subscribe to our feeds and see what titles queued for digitization, as well as those already completed and online. The Russo-Japanese War, 1904–5, grew out of a struggle for dominance and influence over Manchuria and Korea. Russia was interested in maintaining and expanding trading ports in warmer southern coastal areas and eyed both Manchuria and Korea as desirable. Japan was willing to negotiate an agreement where Russian could control Manchuria but leave Korea alone. Russia’s rejection of this proposal led to an armed conflict with Japan. Tsar Nicholas II assumed Russia would prevail over a Japanese military he viewed as inferior. However a series of quick Japanese victories led to the fall of Port Arthur and the eventual destruction of the Russian fleet. With Tsar Nicholas unwilling to accept the humility of an outright surrender, Theodore Roosevelt stepped in and mediated a peace treaty between Russia and Japan in 1905. The outcome of the conflict was a weakened Russia and the rise of Japan as a military power with imperialist ambitions. Starting with the Crimean War, photography was recognized as lucrative and influential for journalistic documentation as well as persuasive propaganda. Images could be more powerful than first hand written accounts and hold sway with public opinion more immediately and effectively. 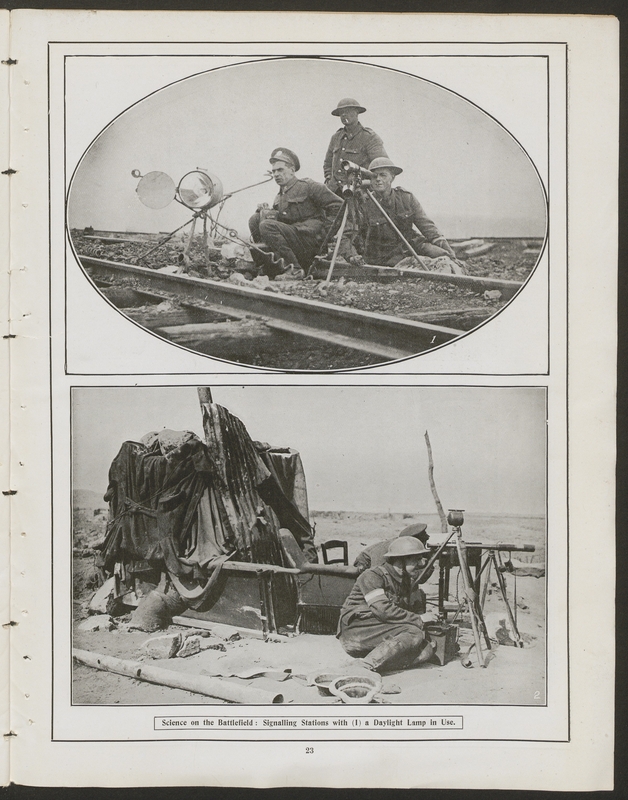 The Russo-Japanese conflict was the first war to be fully recorded by the international media, with journalists, photographers, and even motion picture makers capturing the battles and publishing these images across the globe. 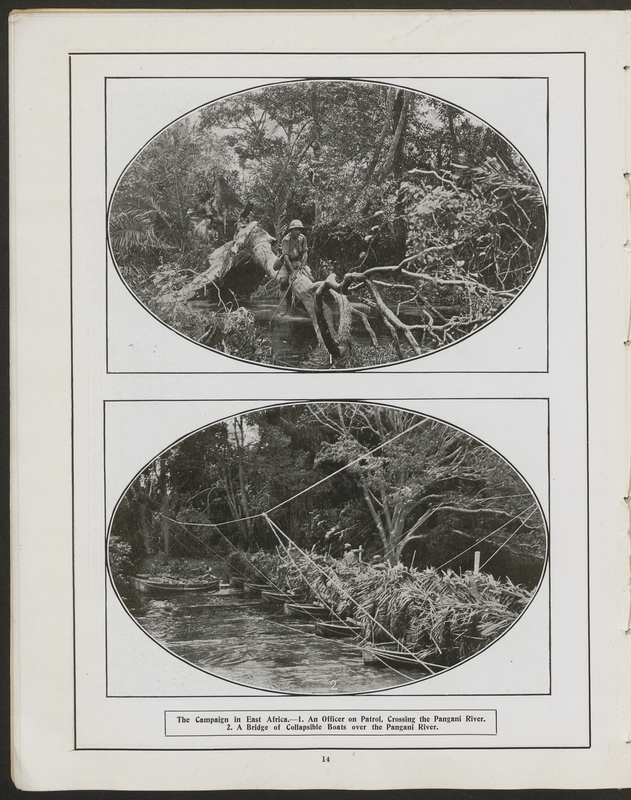 The publication 大本營寫眞班撮影 = The Russo-Japanese War taken by the Photographic Department of the Imperial Headquarters, was produced by the notable Ogawa Kazumasa, a photographer, publisher, and pioneer of photomechanical reproduction. Ogawa was a talented marketer and understood the potential for photographic reproductions, providing images from tense battle scenes to the mundane moments waiting for action. Japan. Rikuchi Sokuryōbu, & Japan. Daihonʼei. Shashinhan. (1904). Nichi-Ro Sen’eki shashinchō : Rikuchi Sokuryōbu tokkyo. Tōkyō: Ogawa Isshin, Meiji 37-39 [1904-1906]. Folklorist D.R. 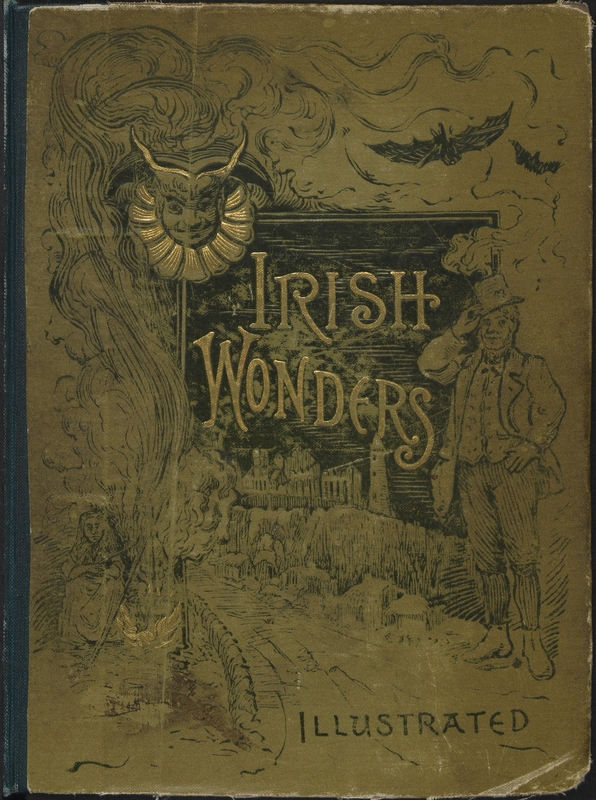 McAnally Jr. researched and compiled an entire volume of Irish legends and tales, Irish Wonders, in 1888. While little is known about McAnally, his publication was especially significant for the literary giant, William Butler Yeats, who consulted this work as he incorporated Irish folktales into his own writings. McAnally’s compilation became the defacto source of Irish tales for subsequent publications and literary collections. 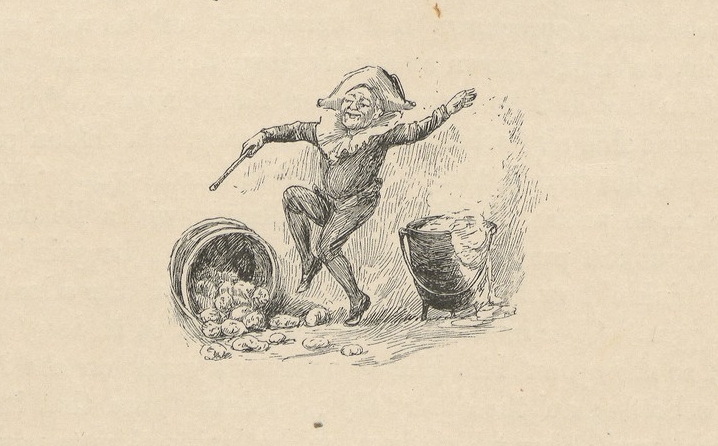 His description and story of the leprechawn, or leprechaun, is notable. He depicts the creature as neither good nor bad, but very mischievous. 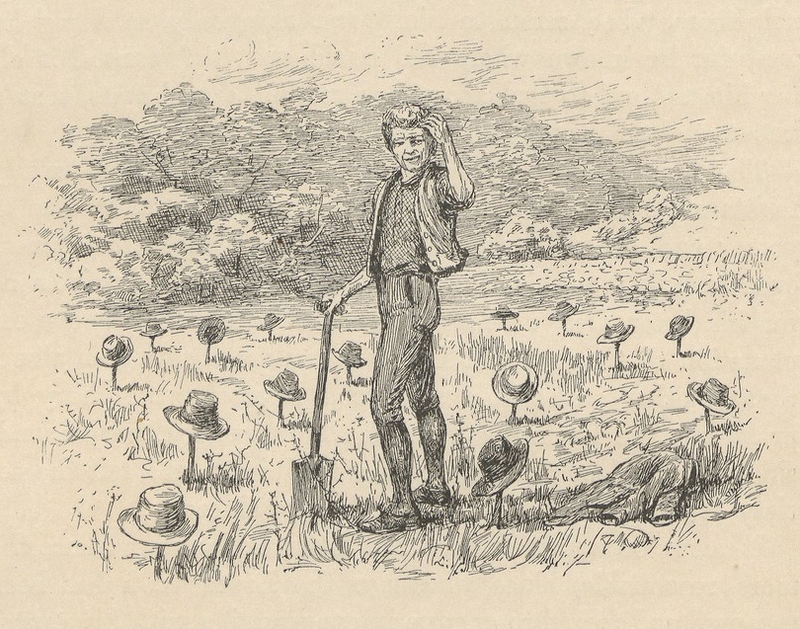 McAnally’s tale of the Leprechawn is also considered to be the first written reference to a “pot of gold”, which has since become an accepted attribute for all leprechaun stories. McAnally, D. R. Irish wonders :the ghosts, giants, pookas, demons, leprechawns, banshees, fairies, witches, widows, old maids, and other marvels of the Emerald Isle : popular tales as told by the people. Boston : Houghton Mifflin, 1888. 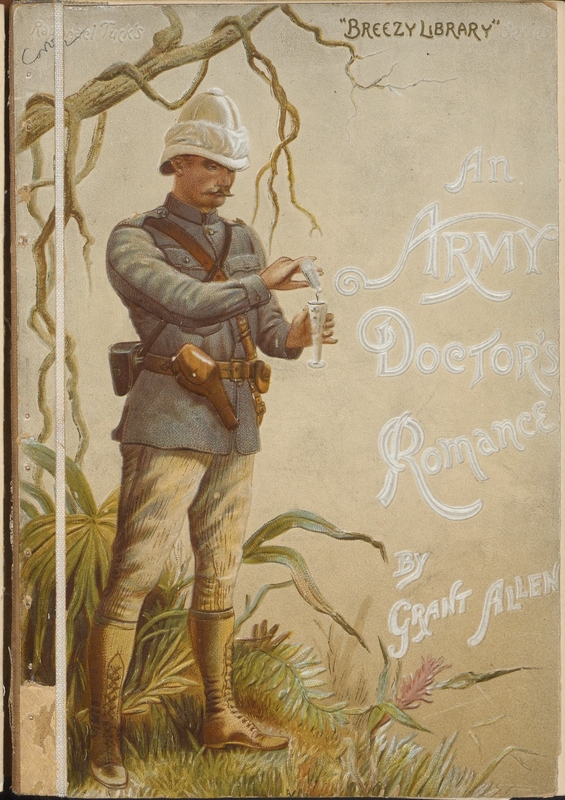 An “Army Doctor’s Romance” is a comparatively slight specimen of Mr. Grant Allen’s powers as a writer of fiction, but it is not without merits of its own. The plot is distinctly ingenious, and has one refreshing variation from conventional fiction. Besides, Mr. Grant Allen, with his wonderful instinct for actuality, has laid the chief scene of the story in Matabeleland during a war between the whites and the Matabeles. There is a vivid description of an attack upon an English lager, which is probably quite as accurate an account of the recent fighting as anything we are likely to get from the special correspondents. How did Mr. Grant Allen succeed in being so completely up to date, seeing that his story must have been printed long before the recent operations began? 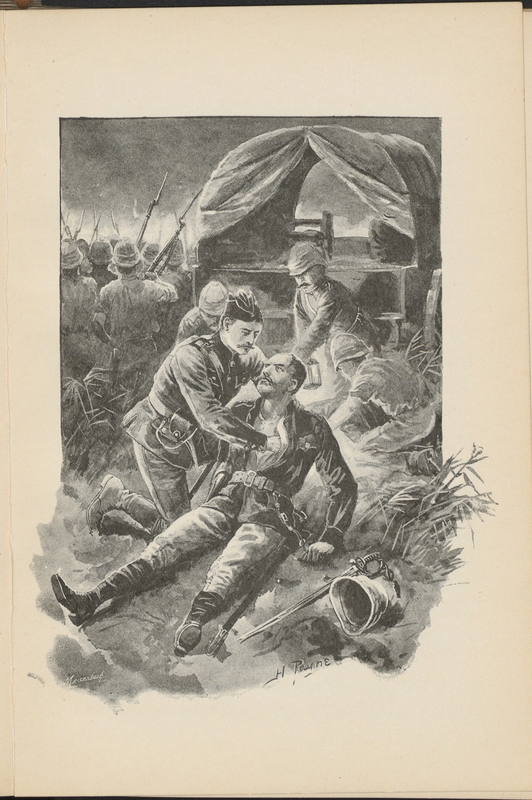 “ An Army Doctor’s Romance ” is beautifully printed and handsomely illustrated, whilst it contains in addition an excellent likeness of the author. 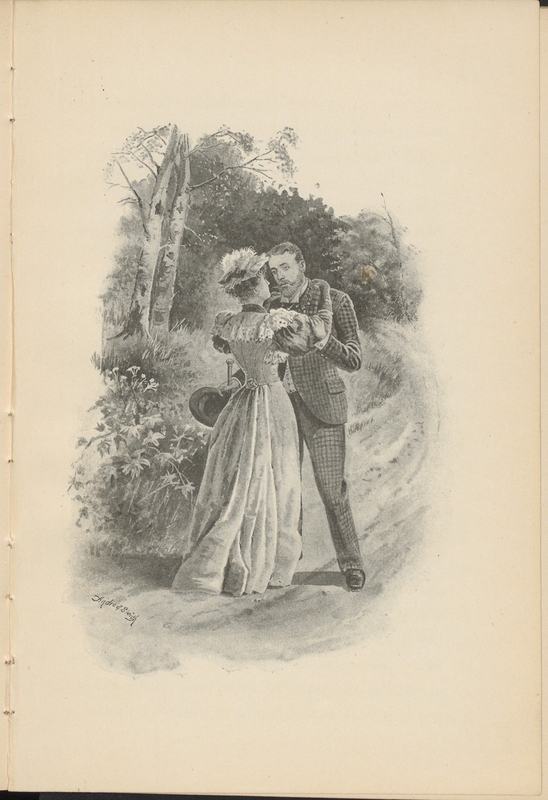 Not long after this publication, Allen wrote the novel for which his most known, The Woman who Did (1895). It is the story of Herminia Barton, a college girl who falls in love with Alan Merrick, but decides not to marry him because of her stance on female emancipation. Instead of marriage, they cohabit giving birth to a daughter, but soon afterwards Merrick, dies suddenly leaving Barton to carry on as a single mother with no marital inheritance. The novel was considered scandalous and caused a great sensation soon after its publication. Allen, Grant. An army doctor’s romance. London ; New York : R. Tuck, 1893. 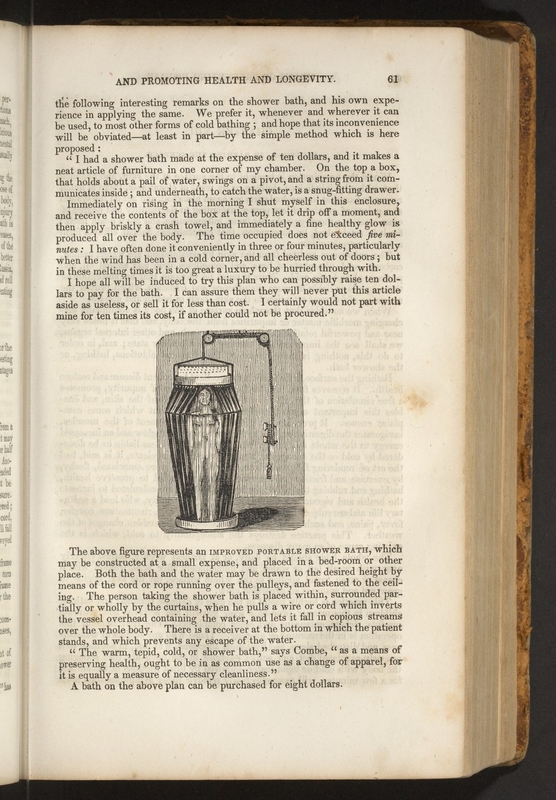 Wooster Beach (1794-1859), was an ardent opponent to the allopathic/heroic medical treatments developed in the 18th century, especially such remedies as blood-letting and purging with mercurials. Beach viewed these methods as both ineffective and likely detrimental to the patient. Instead, he was an advocate for keeping an open mind to treatment options and concentrating on using nature’s remedies, botanical solutions derived from Asian and Native American cultures. 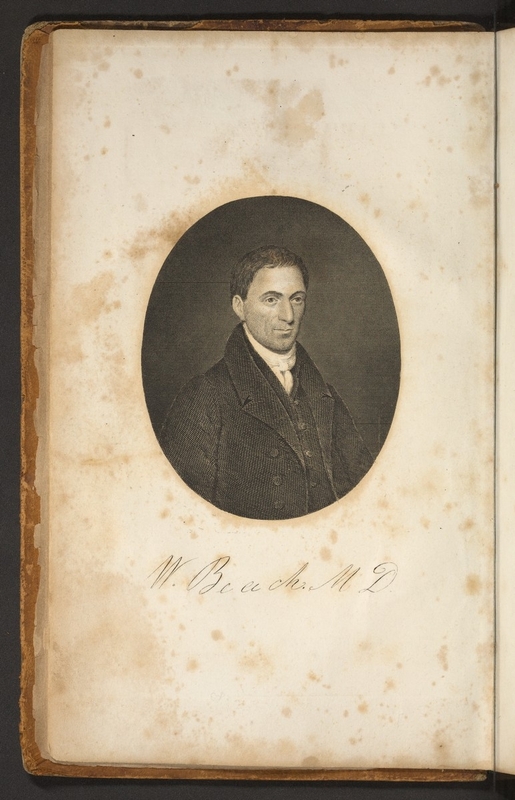 Beach and his followers were often referred to as “botanic,” “reformed,” or “American” physicians. Beach founded a school and method officially known as Eclectic Medicine. The system was a focused on the application of non-invasive practices through the use of botanical remedies or other healing therapies that were in harmony with the body’s natural curative properties. Eclectic Medicine eventually fizzled out by the mid 20th century under the pressure of AMA professional requirements and the established academic matriculation. However, its legacy is still visible in the more recent developments of holistic medicine. 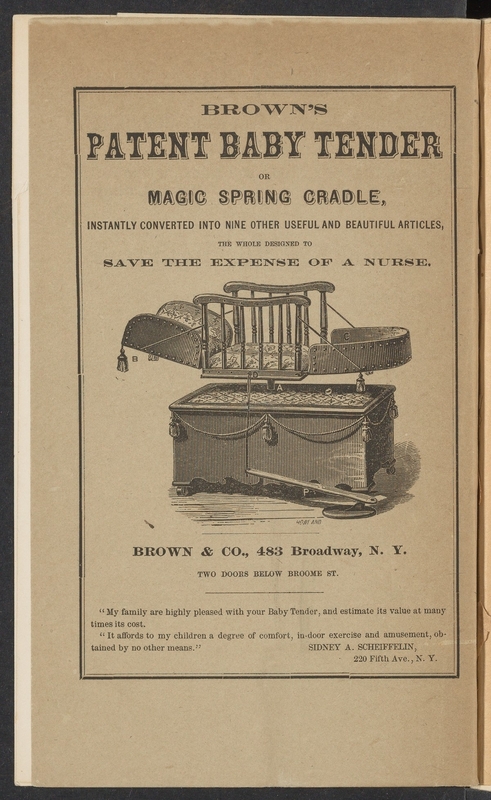 In addition to establishing medical schools, Wooster Beach was the author of at least a dozen medical works, using publication as way to spread his message. Beach was a reformer and was willing to question conventional thinking in society and religious doctrines. Beach understood the power of publicity and became known nationally and internationally through his numerous writings, which he distributed free to many world leaders. 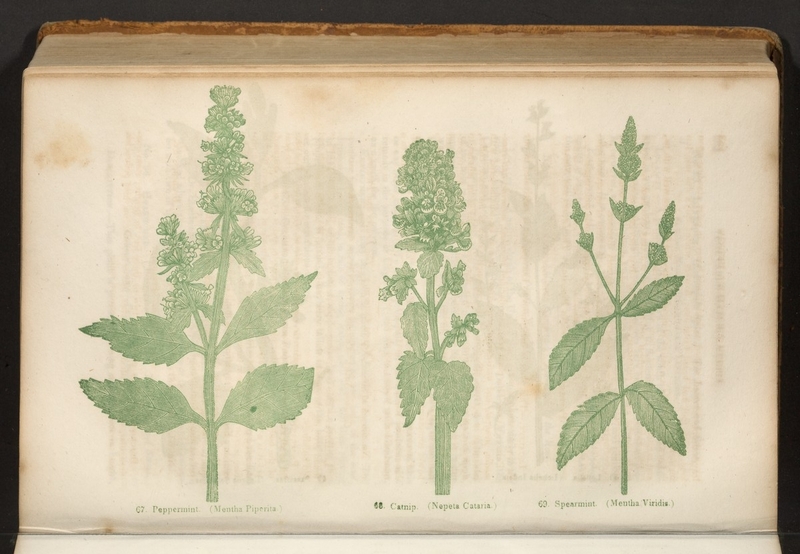 I have spared neither pains nor expense to acquire a knowledge of the practice of the most noted botanical physicians, retaining from each everything which I have proved by experience to be useful. I have not thought it beneath me to converse with root and Indian doctors, and every one who has professed to possess any valuable remedy, or any improved method of treating any disease. The hints and suggestions of experienced nurses and female practitioners have not escaped my notice. ” For,” says a former president of the New York College of Physicians and Surgeons, ” there is not a maxim or remark of any experienced female or nurse which is not based upon sound pathological principles.” They are generally diligent observers of nature, and often point out her indications in a correct and masterly manner, which often disappoints the physician and the friends of the patient. Sickness op the Stomach.—Some women are incessantly harassed by nausea, or sickness of the stomach, and that during the whole period of gestation or pregnancy. For this symptom the patient should take the following preparation : Take sal Eeratus, (bicarbonate of potash,) one tea-spoonful ; peppermint or spearmint tea, half a pint: mix; of this let a tablespoonful be taken occasionally, to be accompanied with the use of spearmint tea. Soda powders have also been found very serviceable to allay the irritability of the stomach in such cases; but the best preparation that I have ever found to relieve the sickness of the stomach attendant on pregnancy is, an infusion or tea made of the rose willow bark, (cornus sericea.) This has proved, in my hands, exceedingly valuable. 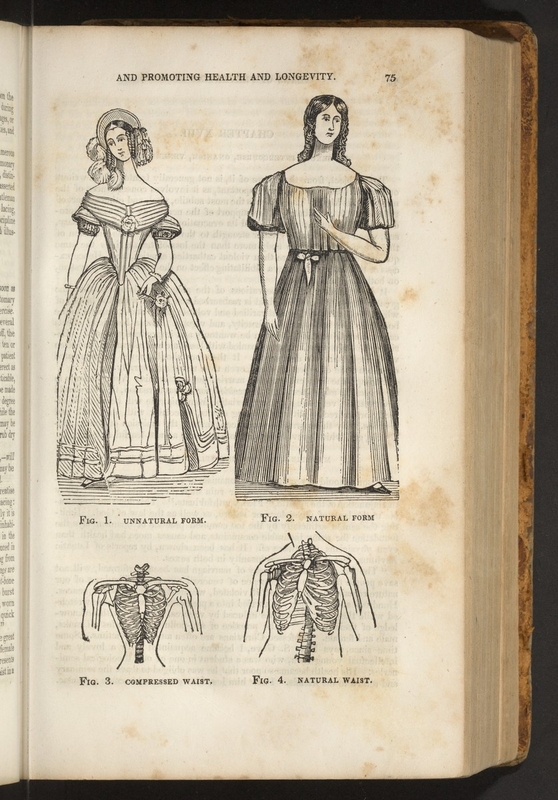 Now a corset, or tight lacing of any kind, fetters the freedom of those bones, destroys all the advantages of the joints and hinges which nature has provided, and thus lessens the room in which the lungs and heart move— besides depriving them of the aid, the impulse they derive from the motion of the bones and muscles. But all this is not half the mischief. The ribs, especially at the joints or hinges, being soft in young people, and the gristles much softer, are compressed by the lacing so as to approach nearer and nearer to the breast-bone in front; sometimes they lap over it and meet each other : nay, there are instances of tight lacing where the ribs have not only passed the sternum and met, but have overlapped each other ! Far short of that extreme, however, fatal effects may be expected. Beach, W. The family physician, or, The reformed system of medicine on vegetable or botanical principles :being a compendium of the “American Practice” designed for all classes, in nine parts … : this work embraces the character, causes, symptoms, and treatment of the diseases of men, women, and children of all climates. 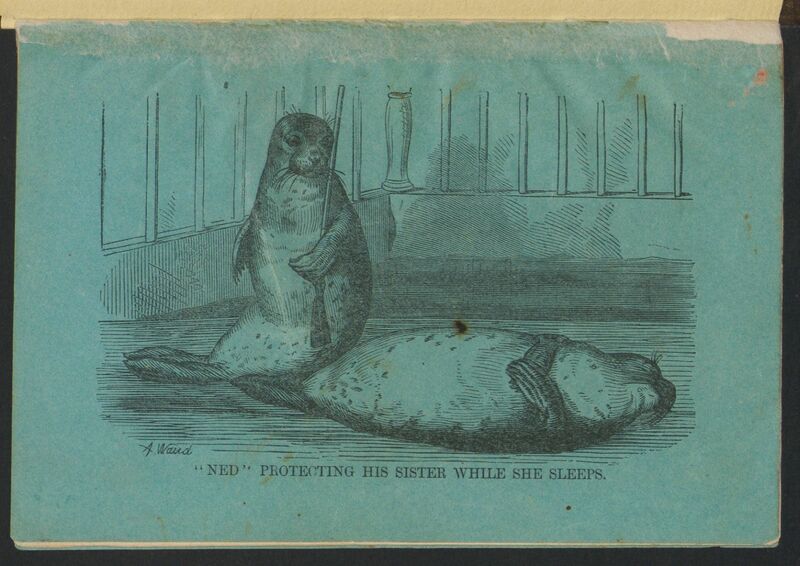 New York : Published by the author, 1843. 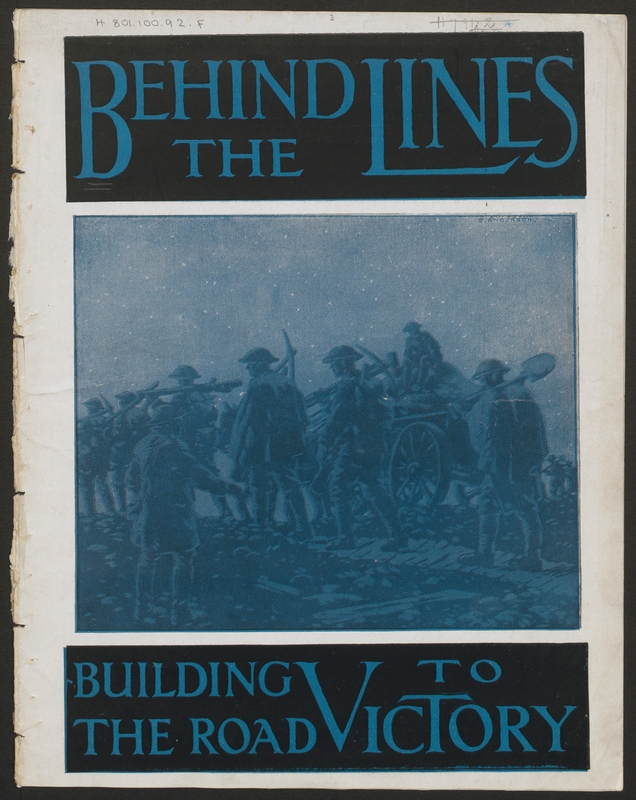 Towards the end of the First World War, the publishing company of Harrison and Jehring published a short series of photo-pamphlets on various aspects of the British war effort. 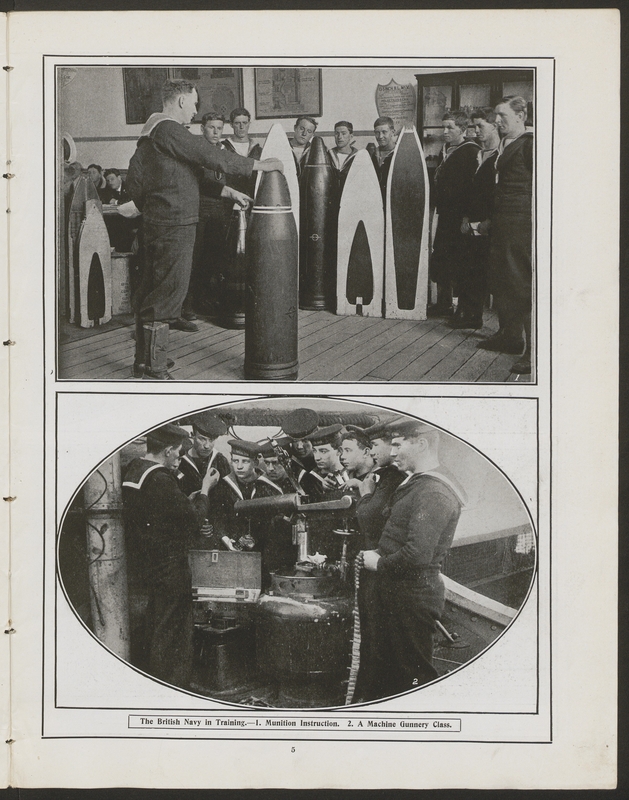 Intended as morale boosters, each pamphlet conveyed the supreme level of sacrifice and resolute commitment by British citizens. The cover art mimicked the simple yet striking characteristics of many posters produced during the war era, while the inside provided numerous on-location photographs, arranged like magazine collages or vignettes. 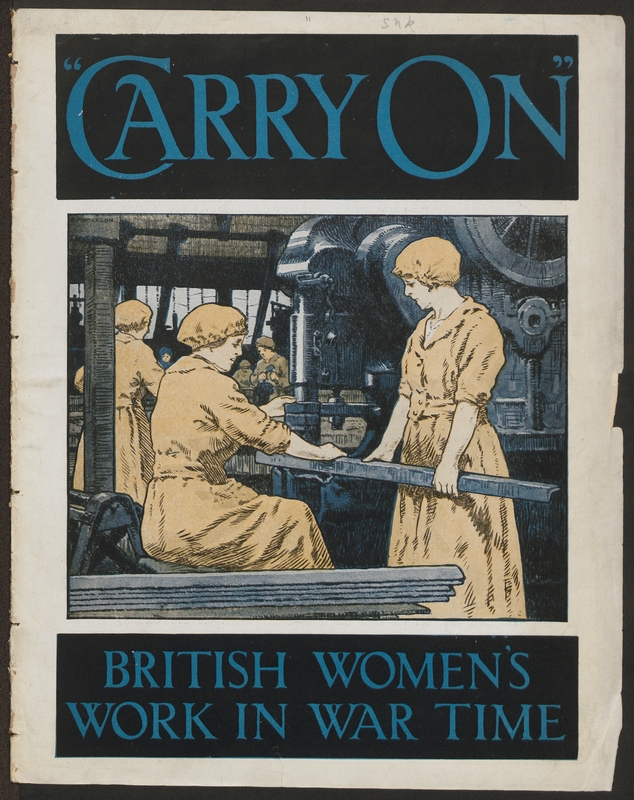 One pamphlet entitled, Carry On: British Women’s Work in War-time, is particularly intriguing. The use of the term “carry on” became more notable in WWII, as in the motivational slogan “Keep Calm and Carry On”, but it really had its origin in WWI as a nod to the British steadfast notion of carrying on business as usual, even amidst conflict and doubt. 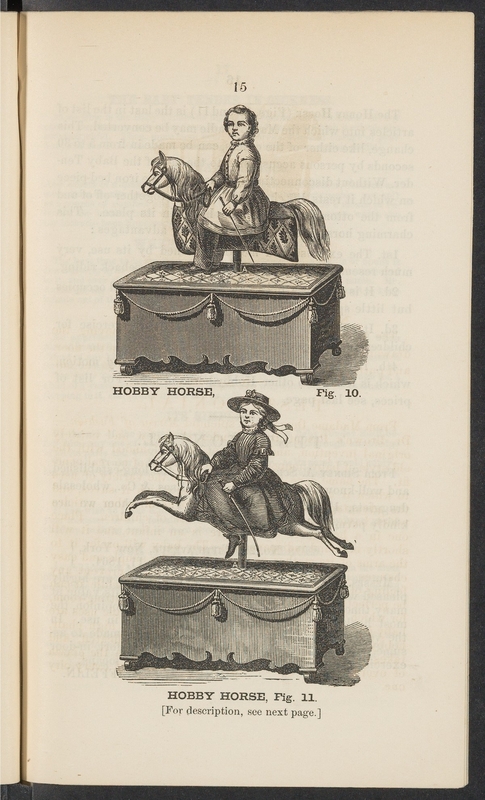 This pamphlet also illustrates the significant contributions women provided in the war effort, pushing the limits of traditional gender roles and ushering in the modern woman. As the war was winding down, Parliament passed an initial act granting the vote to women. But it is not in munition work alone that the face of British industry has been transformed by the extension of women labour. As post-women and police, as bakers and farm workers, as motor drivers and ‘bus conductors— in almost every occupation of which the mind can think — British women are now cheerfully ” carrying on ” while their men-folk are away. In her hour of greatest need Britain has called to her daughters. She has not called in vain. By their industry, their efforts and their heroic sacrifice, the women of Britain have saved their country and saved the world. 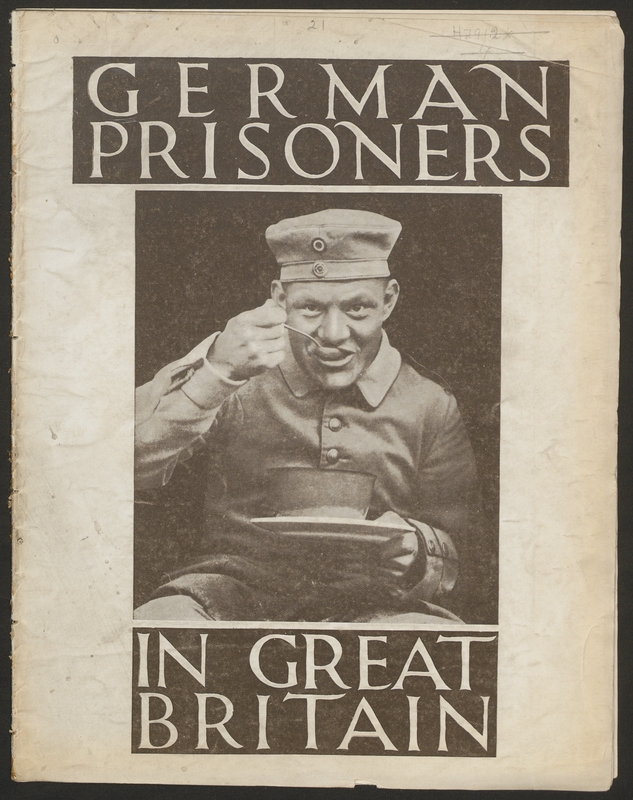 In another pamphlet, German prisoners in Great Britain, the publisher highlights the humane and considerate accommodations afforded to the captured enemy. They illustrate nearly every aspect of life in the camps, and show that the excellence of the conditions under which the prisoners live are in striking contrast with the regime which obtains in many of the prisoners’ camps in Germany. It is only necessary to recall the horrors of a Wittenberg or a Gardelegen to appreciate the admirable organisation of the prisoners’ camps in Great Britain. 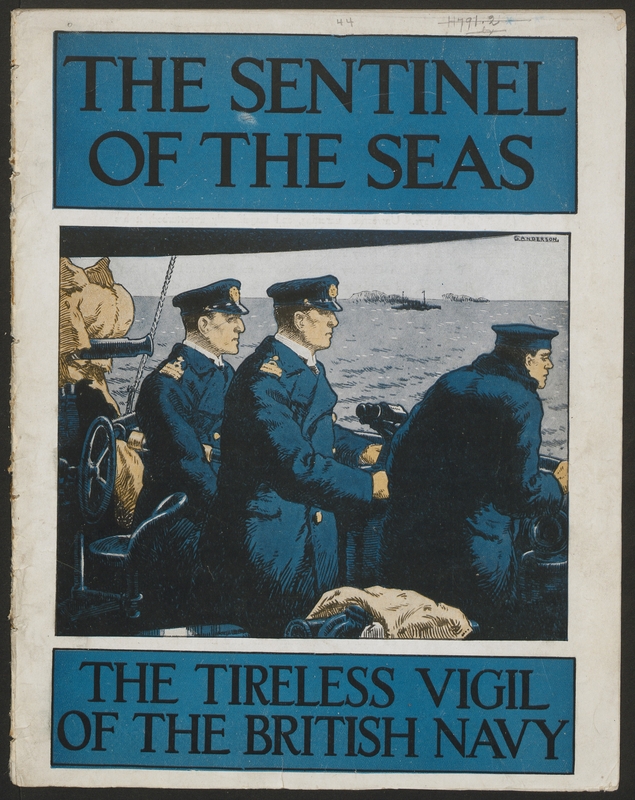 The sentinel of the seas :the tireless vigil of the British Navy. London : Harrison, Jehring, [1917?]. Behind the lines :building the road to victory. London : Harrison, Jehring, [1917?]. 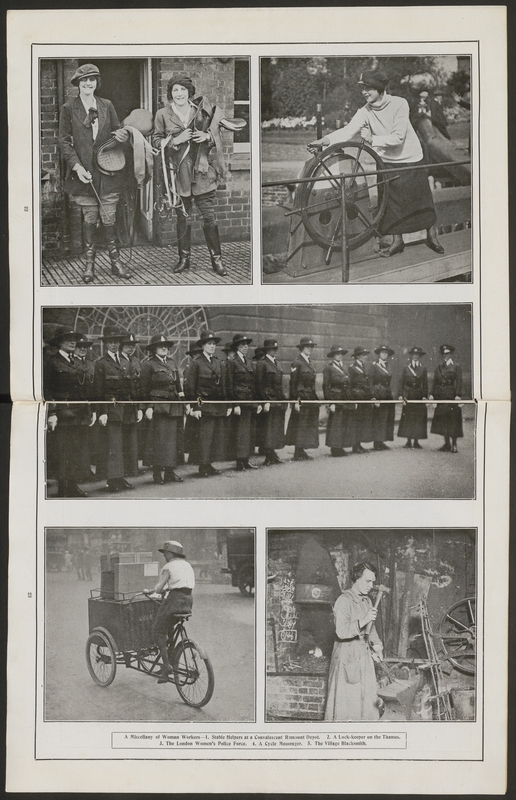 Carry on :British women’s work in war time. London : Harrison, Jehring, [1917?]. 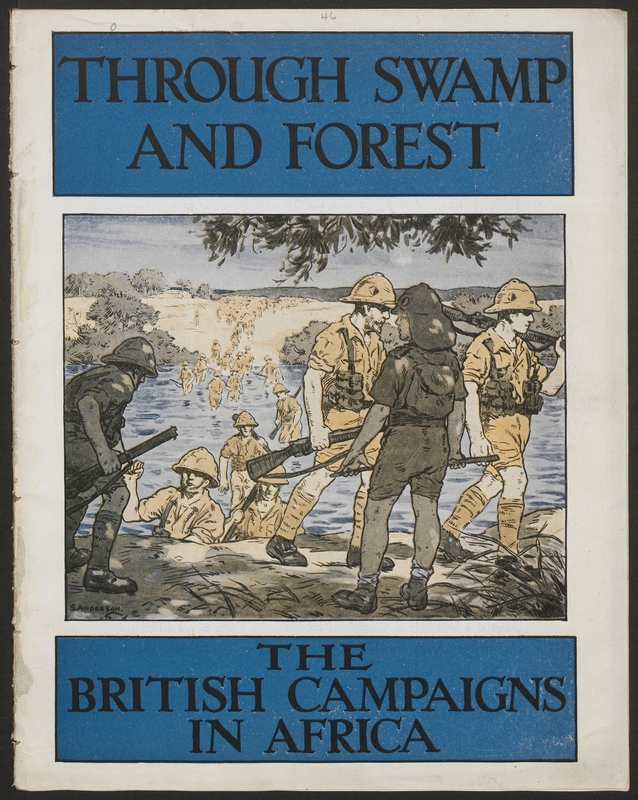 Through swamp and forest :the British campaigns in Africa. London : Harrison, Jehring, [1917?]. 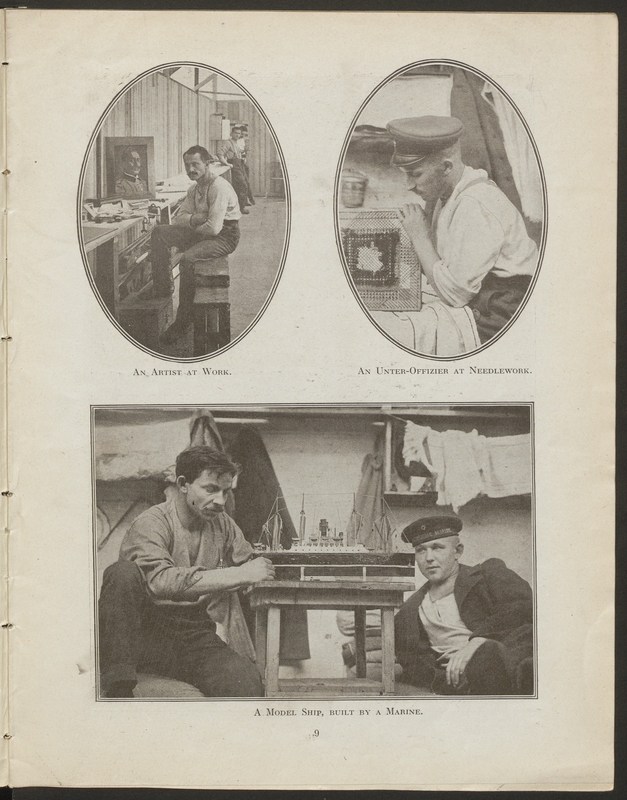 German prisoners in Great Britain. 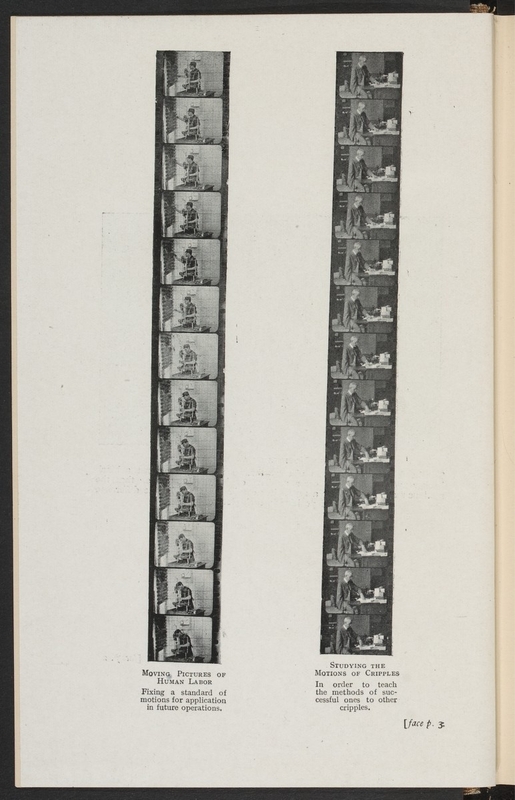 London : Harrison, Jehring, [1916?]. When Prince Ludwig married Princess Therese on Oct. 12 1810, the city of Munich celebrated the occasion over 5 days with a combination of horse races, drinking, and feasting. The anniversary celebrations continued each year, with a growing number of participants, activities, and displays, eventually becoming known as Oktoberfest. 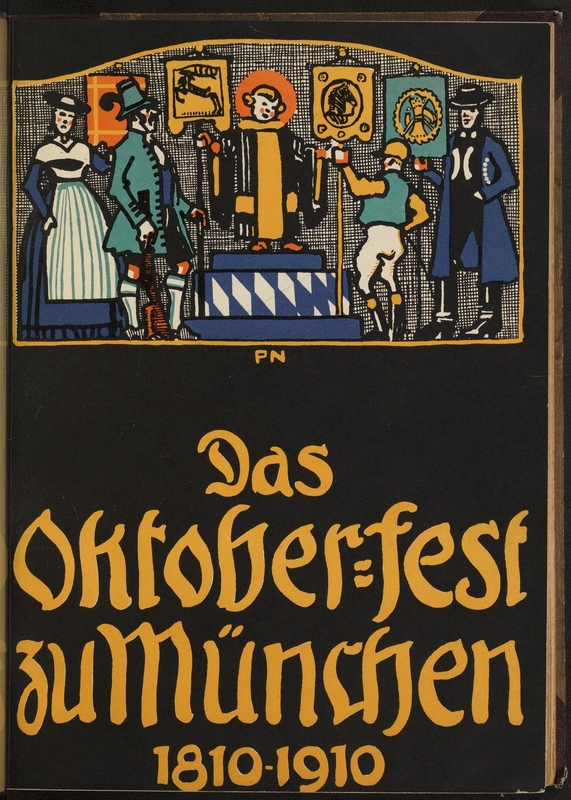 At the 100th anniversary of Oktoberfest in 1910, a jubilee celebration was organized to be greater and more elaborate than any Oktoberfest before. Festivities included historical exhibitions, costumes, parades, rides, music and plenty of beer. It is estimated that visitors to the 100 year Oktoberfest consumed a record 120,000 litres of beer. It was also at this celebration that the Teufelsrad or “Devil’s wheel” ride was introduced. The ride is comprised of a rotating circular platform upon which riders sit or lie. It begins spinning slowly and increases its speed to make riders slide off the platform. Add 120,000 litres of beer to this human whirligig and you have yourself a brouhaha. Ernst von Destouches (1843 – 1916), an archivist, city chronicler, and historian, was a key organizer of the 100 year celebration and created a set of festival anniversary publications. The publication appeared in 1910 in two editions: “a particularly detailed and beautifully made secular edition, of which only a few copies were distributed to select individuals, and a greatly streamlined popular edition published for the masses”. Some of the illustrations were done by Paul Neu, a local artist who provided significant works for the Oktoberfest exhibition grounds in Munich. Destouches, Ernst von 1843-1916 author. Jahrhundertfeier des Münchener Oktoberfestes (Zentral-Landwirtschafts-Festes) Gedenkbuch. München : J. Lindauersche Buchhandlung (Schöpping), 1912. Destouches, Ernst von 1843-1916 author. 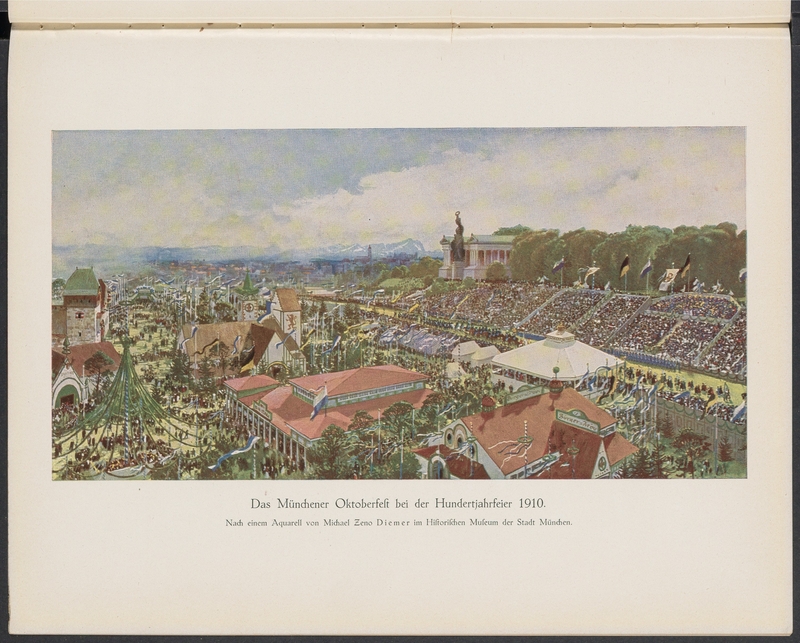 Münchener Oktoberfest (Zentral-Landwirtschafts-Fest) 1810-1910 Gedenkbuch zur Hundertjahrfeier unter Mitwirkung bayerischer Schriftsteller. München : J. Lindauersche Buchhandlung (Schöpping), 1910. Lillian Moller Gilbreth (1878-1972) was a pioneer in blending psychology and engineering into the management of the workplace. In recognition of her accomplishments, Lillian Gilbreth was the first woman to be elected to the National Academy of Engineering, and until recently, the only woman to have been awarded the Hoover Medal for great, unselfish, nontechnical services by engineers to humanity. Her doctoral dissertation, The Psychology of Management, Gilbreth laid out three fundamental recommendations for management– focus on the worker’s well being, provide individualized training, and use psychological testing to match jobs with workers. In addition to these academic achievements, she was a mother to 12 children and become the role model for the mother in the book and subsequent movie “Cheaper by the Dozen”. For most of her early career, she was overshadowed by her husband and partner in the field of scientific management, Frank Gilbreth, with publications mostly credited to him. 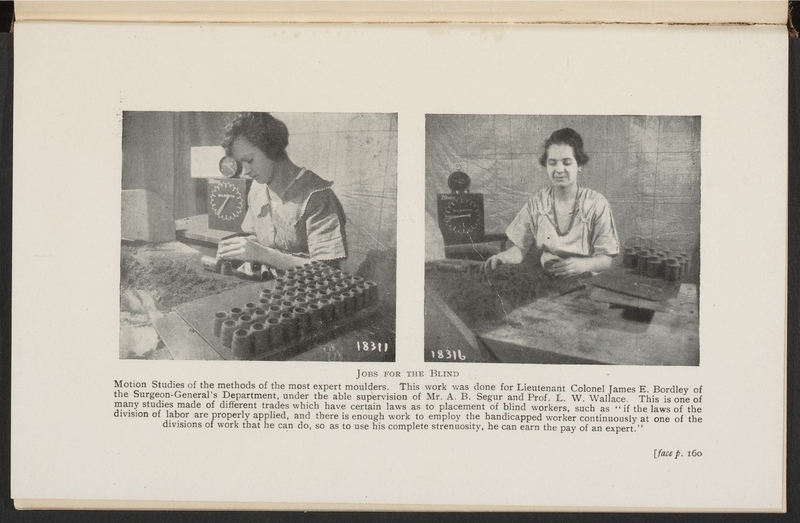 While her husband focused much more on the scientific and technical study of efficiencies in production, Lillian would be more concerned about worker welfare and reducing stress, fatigue, and boredom. Together, their partnership resulted in comprehensive and innovative publications in the field of workplace efficiency. 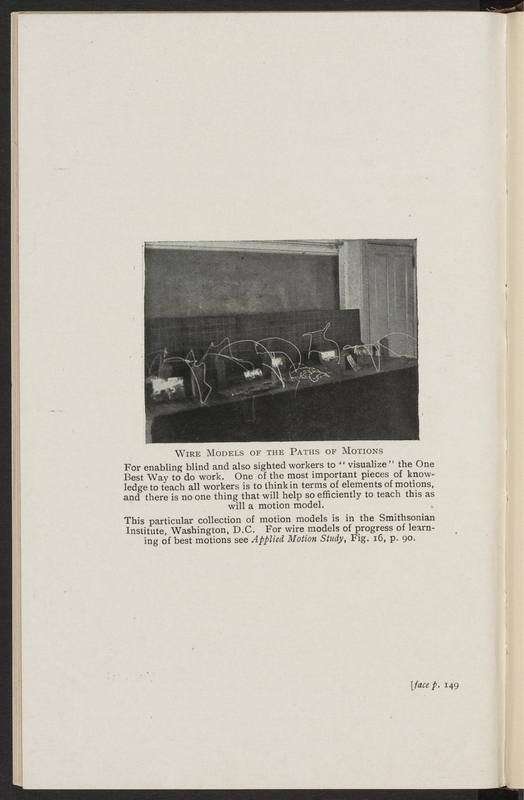 The crux of the Gilbreths’ work was the creative application of motion picture film to quantify the number of motions involved in a specific work task and the time required to carry it out. The resulting data and images provided a model in which to calibrate and adjust basic human motion for greater efficiency and less physical and mental stress. 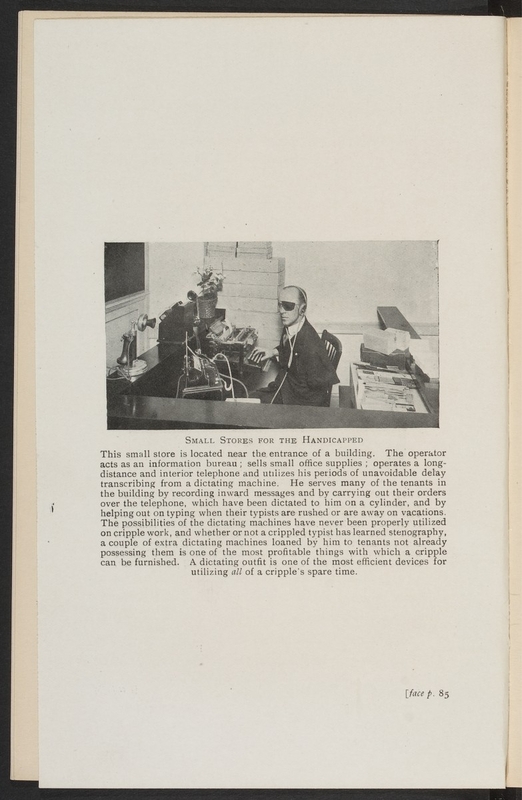 Due to the injuries and disabilities resulting from WWI, Frank and Lillian also became proponents of workplace solutions for those with disabilities. Their publications would help employers understand how to modify environments and workflows to accommodate the worker’s physical limitations. 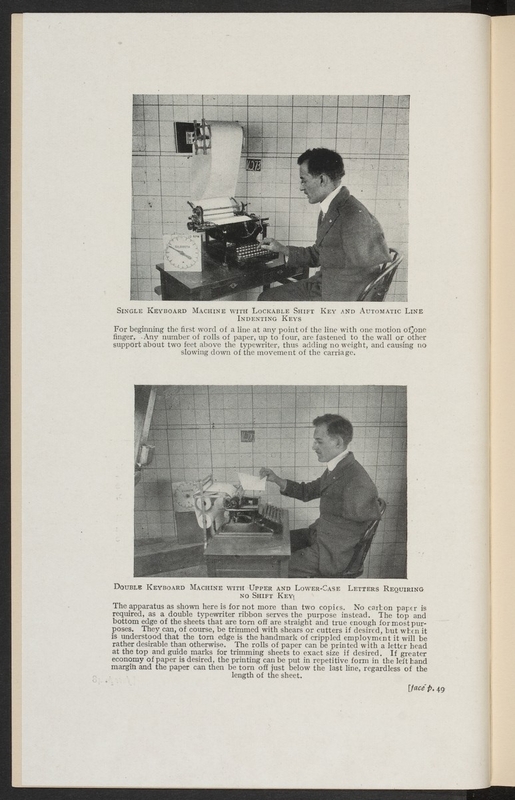 This book, “Motion Study for the Handicapped,” which was published in 1917, is considered the first book to provide in-depth investigation into occupational rehabilitation. In the volume, Frank demonstrates the application of motion pictures to break down the essential motions in a job and how to pare them down to their bare necessities, increasing production efficiencies and reducing worker fatigue substantially. He created flow charts and elaborate 3D models to track movements of workers and products through their various stages to develop better work environments. The aim of this book is to present methods of least waste in training and placing the handicapped, to tell not only what has been done and what can be done but also actually how to do it and why it should be done in this manner…. Along with these the many manufacturers who have placed their devices at our disposal ; the managers and workers in the industries who have cooperated in our investigations and offered opportunities to those whom we have trained ; and especially, perhaps, the handicapped themselves, who have demonstrated their successful methods, offered their experience, voluntarily acted as subjects for investigations, and cheerfully followed all suggestions offered. The progress in work for the handicapped along all lines is astounding. 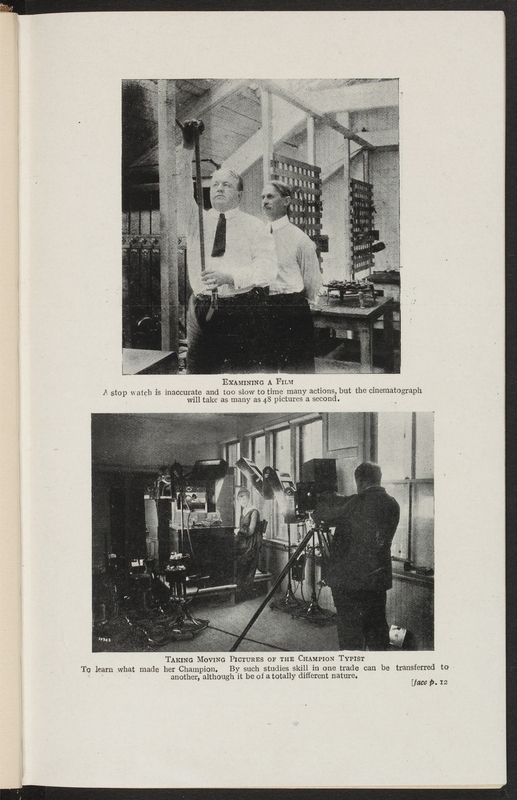 Mr. Gilbreth has set out to take moving pictures of as many champions or experts in various trades or sports as he can, in order to study their methods and find the points of similarity between their motions. So the champion typist of the world, an expert bricklayer, and Christy Mathewson, the famous baseball pitcher, have been photographed ; and a few months ago, in Germany, Gilbreth took pictures of the champion fencer of the world. He even hopes to get pictures of the champion oyster-opener of Rhode Island !…Motion study for the blinded, like Motion Study for the crippled, involves three branches of work— teaching the teachers of the blinded, teaching the blinded themselves, and discovering opportunities in the industries where the taught can be satisfactorily placed. Again, through the packet method, which provides for the arrangement of materials on a proper support and in the required sequence and the proper position to be transported to the next operation, it is possible to combine ” Search ” (1), ” Find ” (2), ” Select ” (3), ” Grasp ” (4) and ” Position ” (5), and to make of the entire five elements one operation requiring nothing but a simultaneous reach and grasp. The elements ” Assemble ” (7), ” Use ” (8), and ” Dissemble ” (9) can also, in many cases, be performed without the use of the eyes and with the effort involved much minimized through the use of proper desks and work-benches, chairs, arm-rests and foot-rests. An enormous amount of fatigue can be removed on many types of operations if the forearms are properly supported. Gilbreth, Frank Bunker. Motion study for the handicapped. London : G. Routledge & Sons, 1920. Noah Brooks (1830 – 1903) is most notable as a journalist, editor, and early biographer of Abraham Lincoln. In fact, he was a close friend of Lincoln and a regular visitor to the White House. Brooks was even invited to the presidential box at Ford’s Theatre the night Lincoln was assassinated, though he was unable to attend due to an illness. Seemingly trivial in comparison to his work on Lincoln, Brooks is also credited with writing the first novel about baseball in 1884. The novel is set in a manufacturing town near Chicago, just after the Civil War, where the two local teams debate whether “training” or “muscle” is more important for building a great baseball team. In the end, they concede both methods are necessary for success and agree to play their common rival in a major event. 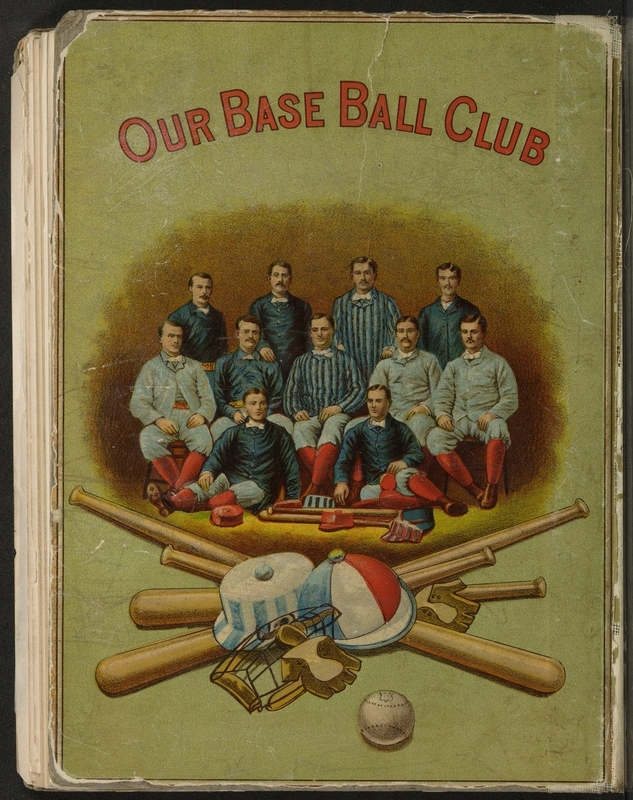 Al Spalding, former pitcher and sporting goods magnate, provides an introduction to the novel where he praises the author for his accurate and faithful portrayal of the game. 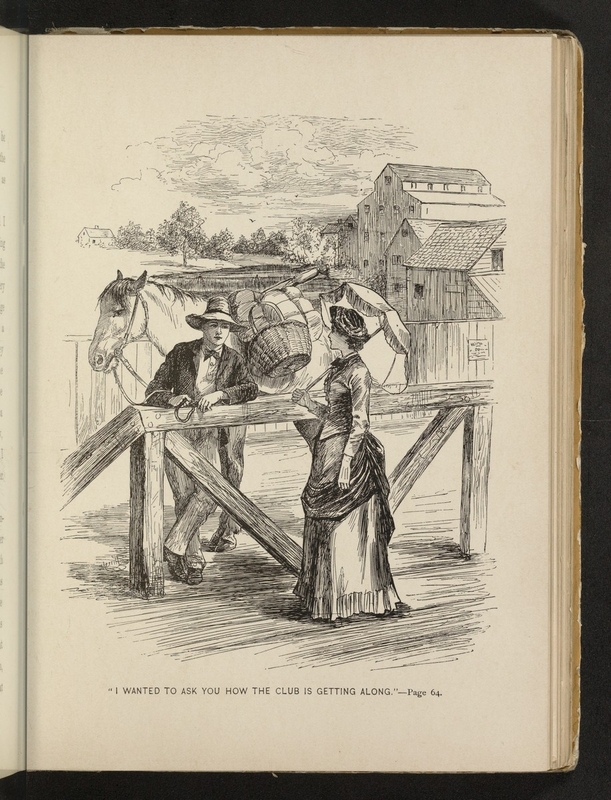 While the storyline is rather banal, the novel does surface some interesting cultural aspects of baseball in America during the 1860’s, including the role of women, post-war anxiety, and the prevalence of gambling. Baseball was growing fast and facing some big debates about the integrity of the game and amateurism versus professionalism. Some scandal was created by the appearance of Hank Jackson on the street with a roll of bills, offering to make bets on the game. It had never been the custom of anybody in Catalpa to wager anything on a base ball game, and there was some frowning now on the part of conservative and upright people; and those who were not specially conservative, but who disapproved of gaming. 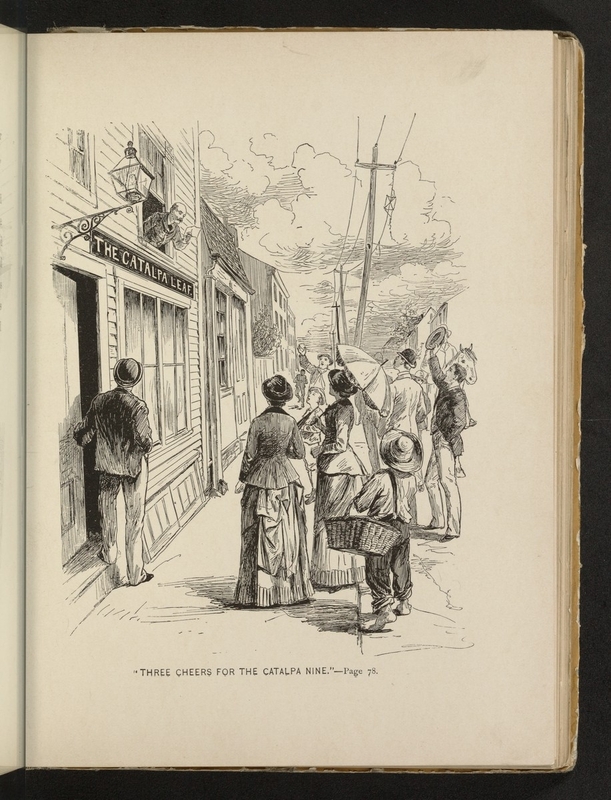 Since the outbreak of the war, when everybody was scraping lint, making “comforts” for the soldiers, or marching to the front, there had not been so hot a fever of enthusiasm in Catalpa. 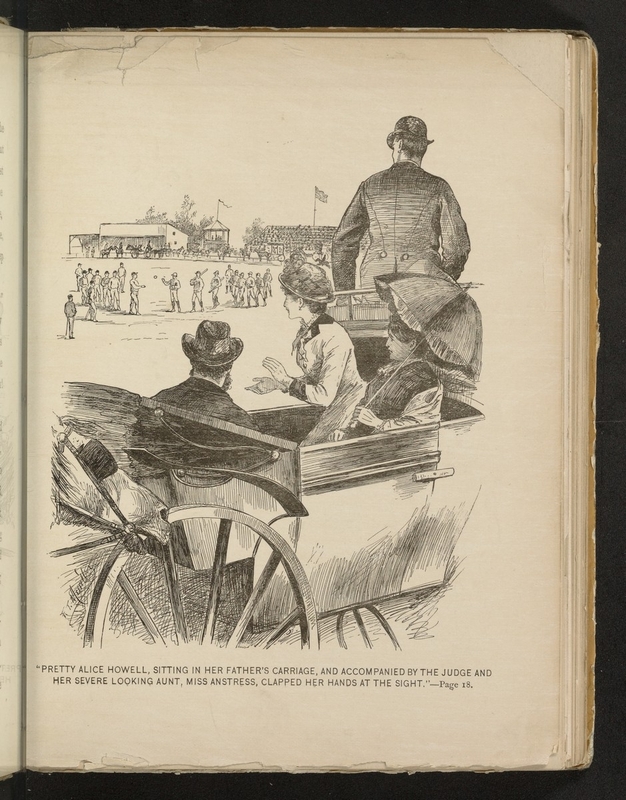 The soldiers of this new campaign were the lusty young heroes up in the Agricultural Fair Grounds who were doing battle, every day, with imaginary foes and making ready to face the real antagonists who could not now be very far off; for the base ball season would open in a few weeks. Alice Howell was flattening her pretty nose against the window pane as she looked ruefully out into the misty atmosphere that surrounded her father’s house in North Catalpa. It was eight o’clock in the morning, and the great base ball match was set for two o’clock, that afternoon. As soon as she had risen, Alice had run to the window to see what were the signs of the sky, for Alice was an ardent lover of the American game, and her heart was set on the great match that was to come off on the Agricultural Grounds, near Catalpa, that day. 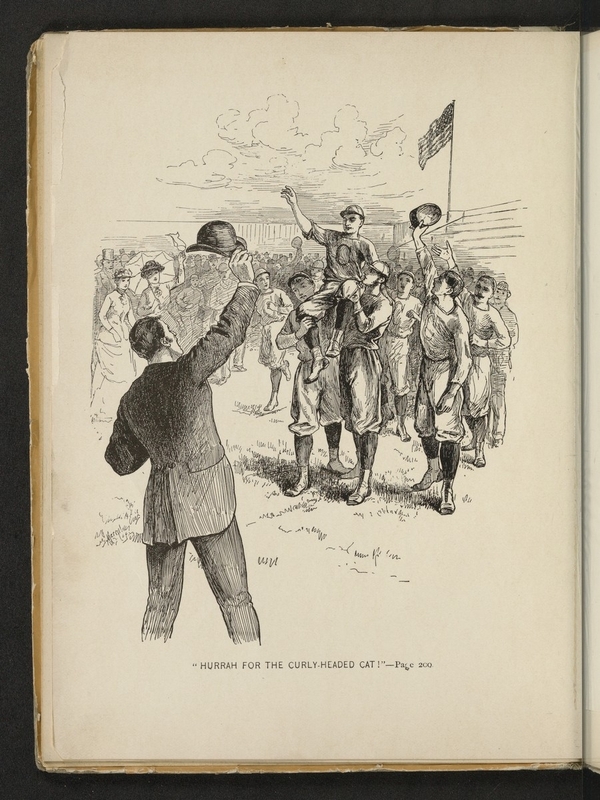 [The publishers] have shrewdly taken advantage of the very widespread interest in the national game of baseball that now prevails to publish a novel based upon the subject. 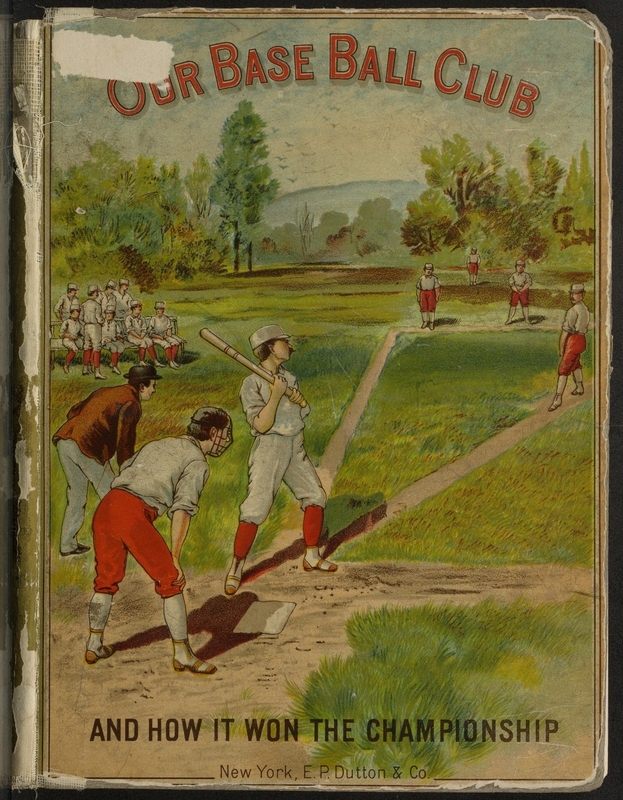 Its title is “Our Baseball Club, and How It Won the Championship,” and its author is Noah Brooks, a well-known journalist, and the writer of one or two successful boys’ stories. 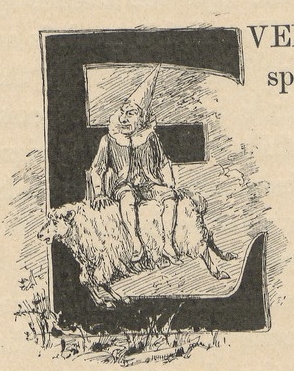 The present is a tale which will interest the boys throughout the land, but it is not exclusively a boys’ book. Mr. Brooks is evidently familiar with the game, and this is only another way of saying that he genuinely admires it. He well appreciates the capabilities that it has for being utilized in fiction, and has made a very successful employment of them for that purpose. There are the points of a good love story connected with the plot, and there is also a picture given of the dramatic contests for supremacy, the tricks resorted to by the less honorable players, who scheme for defeat, and of everything, in short, that is necessary to unfold the panorama of ball-playing to the public. The work has enough of literary flavor to make it interesting without being pretentious in this connection. Brooks, Noah 1830-1903 author. Our base ball club and how it won the championship. New York : E.P. Dutton and Company, 1884. Isaac Titsingh (1745-1812), a senior official of the Dutch East India Company, had exclusive contact with Japanese officials during his time in Dejima from 1779-1784. Dejima was the artificially constructed island at Nagasaki used as the sole trading post with the Dutch. Titsingh had diverse interests and was considered a scholar and philosopher, in addition to his capacity as a merchant and ambassador. He was intrigued and fascinated with Japanese culture, history, and tradition. 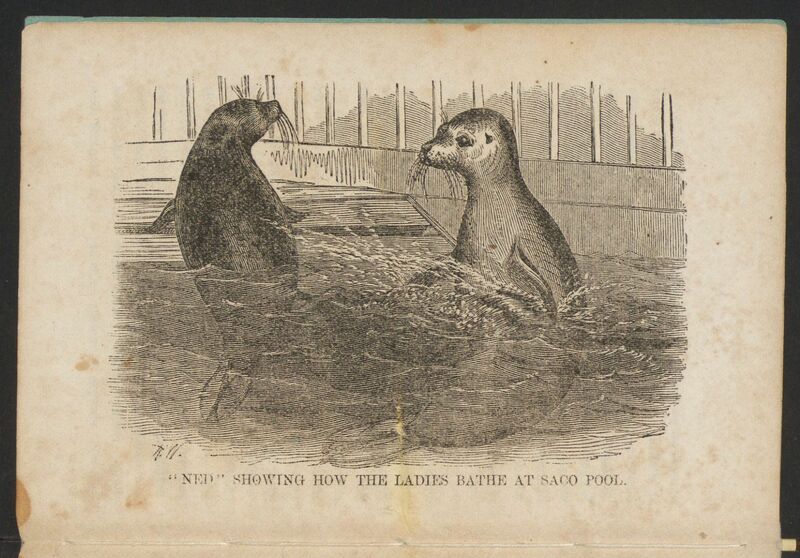 During his stay in Japan, he documented and collected information, seeking original sources whenever possible. Titsingh was relatively persuasive and successful at negotiating access to Japan mainland, witnessing places and events that no European had before. 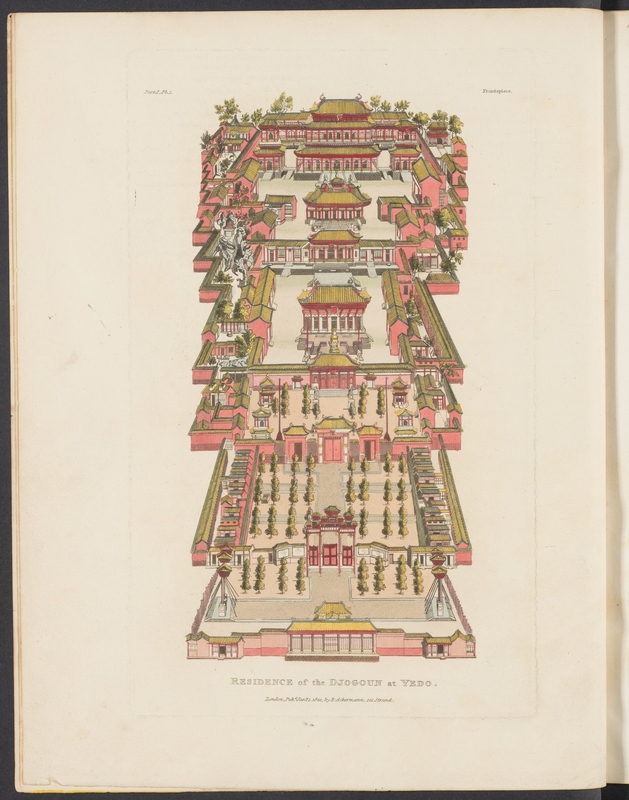 He did not want to compile a mere travel account of his time in Japan, but aspired to create a publication in multiple European languages that would illustrate the sophistication of the Japanese people and their unique culture. 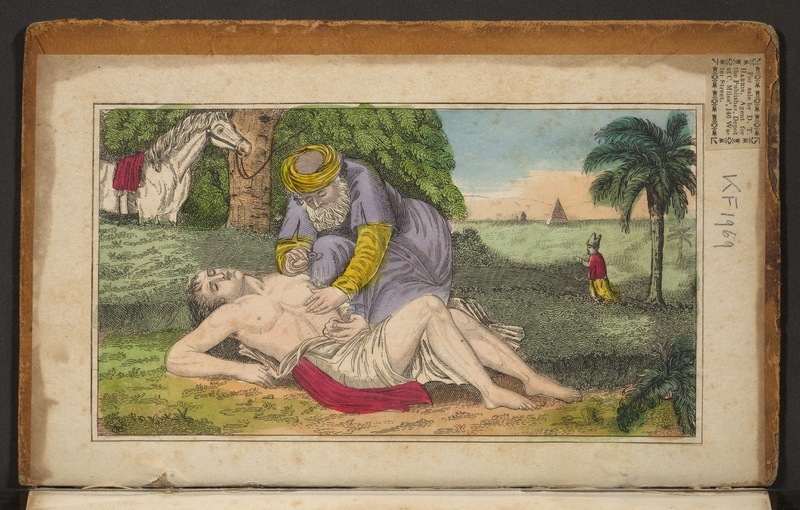 Titsingh wished to have his book published in three European languages that he deemed important: Dutch (the language of trade and commerce), French (the language of philosophy), and English (the language of natural and modern sciences). Unfortunately, due to political conflicts and commercial turbulence, he was unable to achieve his goal. His collection was not published until after his death, with the support of two of his friends. The place where the Dutch reside is called Desima, that is, the Advanced Island, or the island situated before the town. The Japanese sometimes call it Desima mats, or Desmia-street, because it is reckoned among the streets of Kangasaki, and is subject to the same regulations. It is not far from the city, and has been artificially formed in the sea, which hereabout is full of rocks and sandbanks, and very shallow. The foundations, to the height of a fathom and a half or two fathoms, are of hewn stone, and at flood tide are about half a fathom above the surface of the water. In figure it nearly resembles a fan without a handle…It is usually reckoned that the area of our island is equal to that of a stadium, being six hundred feet in length and two hundred and forty in breadth. One wide street runs the whole lenp-th of the island : there is also a path all round it, along the deal fence by which it is encircled. This path may be closed if necessary. The water from the gutters runs off into the sea by means of narrow curved pipes, made so on purpose, lest any thing should be smuggled away from the island. On the 28th of the 6th month of the third year Ten-mio (July 27 1783), at eight o’clock in the morning, there arose in the province of Sinano a very strong east wind, accompanied with a dull noise like that of an earthquake, which increased daily, and foreboded the most disastrous consequences. On the 4th of the seventh month (August 1st. ), there was a tremendous noise and a shock of an earthquake ; the walls of the houses cracked and seemed ready to tumble ；each successive shock was more violent, till the flames burst forth, with a terrific uproar from the summit of the mountain, followed by a tremendous eruption of sand and stones : though it was broad day, every thing was enveloped in profound darkness, through which the flames alone threw at times a lurid light. Till the 4th of August the mountain never ceased to cast up sand and stones…. As soon as the hymn is finished, the women, the colleagues of the deceased, and his acquaintance, return home, and are complimented at the door of the temple by the relatives, who wait there for the purpose. After their departure the relatives proceed in haste to the grave, where, in the interim, a priest reads some hymns till their arrival. The moment they are come, the tub containing the body is taken out of the quan, and deposited in the grave, which is then filled with earth, and covered with a flat stone, and this is again covered with earth. Over the whole is placed the quan, which is removed at the expiration of seven weeks, to make room for the sisek or tombstone, which is prepared in the mean time. When the near kinsfolk on each side have contracted mutual relationship, the fikiwatasi is brought. The father of the bride then presents a mounted sabre, called fiki-demono. It is placed on a tray which stands lower than the others, before the bride’s father. In presenting and accepting this sabre, and the list called tatsi-ori-kami, there is a particular ceremony to be observed. The bride’s father, when he takes the sabre on the tray, advances into the middle of the apartment ; the bridegroom does the same to receive it. Among people of quality this presentation and accepting of the sabre, are circumstances of the highest importance : but among the lower classes they are attended with little ceremony. Titsingh, Isaac 1744-1812 author. Illustrations of Japan consisting of private memoirs and anecdotes of the reigning dynasty of the Djogouns, or sovereigns of Japan : a description of the feasts and ceremonies observed throughout the year at their court : and of the ceremonies customary at marriages and funerals: to which are subjoined, observations on the legal suicide of the Japanese, remarks on their poetry, an explanation of their mode of reckoning time, particulars respecting the dosia powder, the preface of a work by confoutzee on filial piety, &c. &c. London :: Printed for R. Ackermann, 1822.